Derby County's on-loan striker Sam Winnall will be out for the rest of the season "and beyond" after knee surgery. 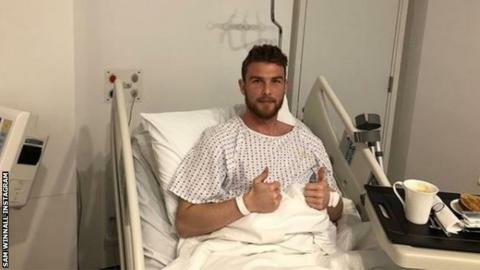 The 27-year-old Sheffield Wednesday forward, who joined the Rams on a season loan in August, damaged anterior cruciate ligaments in the win over Brentford and had surgery on Thursday. "The ups and downs of football, ay? !," he said on Instagram. "I'm devastated." Winnall has made 18 appearances for Derby this season, scoring six Championship goals in six starts. He added: "Everyone from the chairman, manager, backroom staff, players and especially the medical department have been fantastic with me. "I will be forever grateful for the support they have given me and I know I'm in the right hands to get me back for playing as soon as possible. "I'm sure I'll be back scoring tap-ins very soon!"